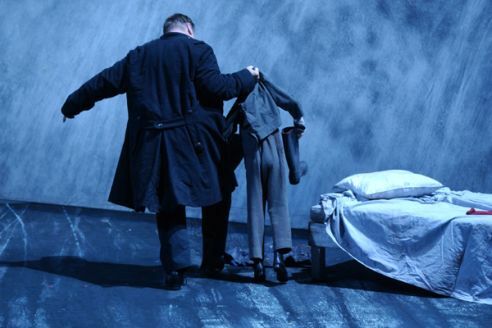 Willy Decker's production of Peter Grimes situates the drama in a gothic Victoriana rife with tension and hostility. 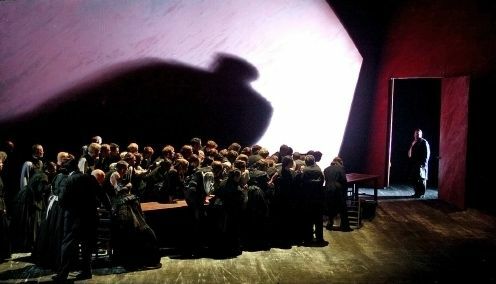 Decker's production originated at Brussels' La Monnaie, and is receiving its first revival at the ROH following a well-received run in 2004. François de Carpentries ably directs. Creeping below every exchange here, even in the bawdier scenes in the drunken second act, is a sense of community-as-crusade. The production seeks to reveal the dark forces that underlie and undergird kinship, that are indeed at the core of the practice of building and sustaining an integrated community, whether that community be in the form of a nation state, or, as it is here, an East Anglian fishing settlement. The steeply inclined stage, the sharp demarcations of the protruding walls, and the quasi-Turner sea backdrops of John McFarlane's set serve to articulate this gothic, almost German expressionist, sensibility very well. The costumes are similarly effective in imbuing the production with a sense of tonal characterisation; black and grey smocks and buttoned-up Victoria dresses dominate, with the exception that is of the bright reds of the ebullient nieces, deceptively smart characters here given layered performances by Rebecca Bottone and Anna Devin. The direction itself is most significant in articulating the acuteness of the community's discourse. Baying and humid crowds feature both in the Prologue and the mob scenes in the second and third acts, whilst otherwise an unsettling homogeneity consumes the community (which brilliantly matches the formality of the music Britten gives to the chorus at these points). Of most impact in the first respect is the spine-chillingly weird hive movement of the women of the community in their slow approach to absorb the dissenting voices of the women's quartet in the second act. In the second respect it is the final gesture of capitulation that is most devastating, when Ellen Orford (Amanda Roocroft) slowly raises a hymn sheet to match the prone gestures of the rest of the community around her. The cast let the production down somewhat. Ben Heppner's Grimes is dramatically compelling, gruff and desperate and an isolate as much by choice as for any other reason, but vocally Heppner lacks the stamina for the role. The range of colour in the voice has dimmed somewhat, and the vibrancy of the higher register, so vital for Grimes, is enervated. In a strange way the exposed nature of Heppner’s vocal performance serves the character rather well, underlining as it does Grimes' brittleness and his gradual deterioration. However, aside from some strong singing in the 'The Truth, the Pity and the Truth' anti-duet with Roocroft (where the singers differing vocal characterisations and their tangential demeanours underlined the tonal duality of the music), and some evocative acting, Heppner's assumption is lacking. Roocroft's performance is beset by similar problems: her diction and sense of line were sluggish throughout, and I felt she consistently over-emphasised vocal expressivity and dramatic character. However, Roocroft's performance was not without its affecting moments. The quite starry largely male supporting cast were generally adequate, with Roderick Williams' charismatic Ned Keene and Jonathan Summers' caring and considered Balstrode proving standouts. The orchestra and their conductor, Andrew Davis, consistently threatened to steal the show. Wonderfully over the top, rip-roaringly loud, and skronkingly intense, their performance, despite some moments of misaligned ensemble and exposed textures (both acceptable casualties of the approach), particularly in the second and fourth interludes, was sweltering. Despite this (metaphorical) heat, the orchestra did not lack precision. I especially appreciated the gradation of colour and weight at each return of Grimes' music, and the dexterous transitions from the awkward formality of the townsfolk's music, into the craggy surfaces and untrammelled lines of the rest. Whilst Decker's production leans a little too heavily on caricature at times (particularly in Jane Henschel's haughty Mrs. Sedley), then, its great achievement is that it discloses the sheer embeddedness of power discourses in daily life, and develops a convincing account of how one such discourse is multiply consolidated. Grimes here is surely a violent and spent man, but the strictures of the power lines in the community, founded on coercion and misinformation as they are, mean that any palliation or rehabilitation of the protagonist would be impossible.